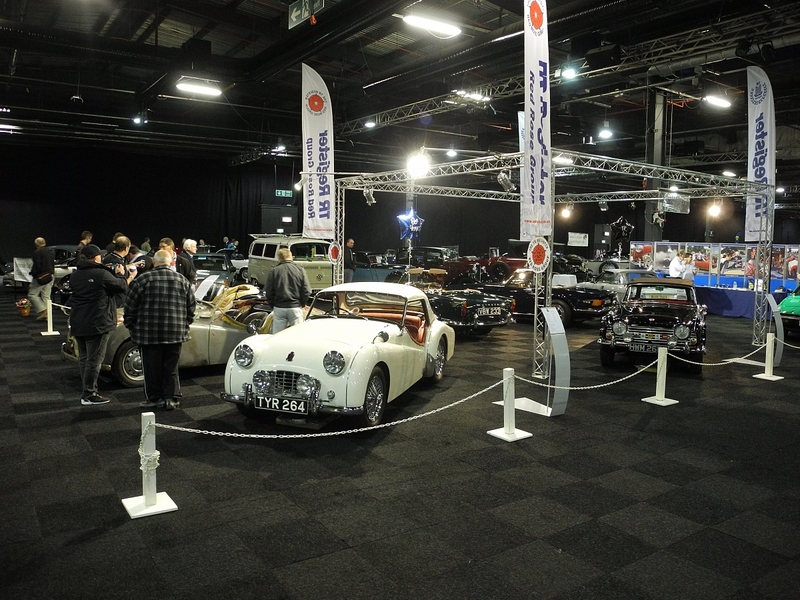 For the fifth year running, the Red Rose group have represented the TR Register at the Manchester Classic Car show at the City Events Centre next to the Trafford Centre. As a little bit of background to the show, the group of people who ran the International Birmingham show for many years run it. Andy Rouse, one of the organisers approached us at one of the Tatton Park Classic shows and asked if we would be interested in entering, this was an opportunity to good to miss so we started planning. Andrew Heywood came on board to help with finding the best cars within the group and with the help of TR Bitz, who supplied a TR5 running chassis for a car they were re-building; we managed to put on a good show. At the first show we had been given a stand towards the rear of the building, the second year brought us further towards the entrance. In order to try to gain a more advantages position we put in a request to the TR Register for the exhibition equipment and staff it possible. This was granted and again we obtained a better position. Each year we changed the cars and improved the presentation with the lighting gantry and the backdrop from the Club and each year TR Bitz providing something interesting we have managed to attract much more attention. Last year we where directly in front of the main entrance with a fully carpeted stand. To one side a massif Mercedes stand including their own mobile kitchen, chef and pianist to keep the members happy. (We can but dream). However, we still managed to attract attention with the cars including the Concourse TR5 of . Coming to this year again we were in the prime position opposite the entrance again not only competing with Mercedes but also Aston Martin and Porsche, who we hid behind the screens, in front of us, on the main passage way, along the wall were the Concourse entrants. The van arrived from Didcot after the usual extended trip up the M40, M5 and M6, for anyone who has had to do this trip will know that it is a journey to miss. With the help of the Red Rose members present, we managed to get Nigel Cluley and his men quickly back on the road home. The remaining members finished up by setting out the seven cars we had room for, everyone has to be out of the hall by 8.00 pm. We followed the International Weekend theme by highlighting the three anniversary cars. In all we had two TR7s convertible, one fixed head, one TR3 one TR4 one TR4A one TR6 and the star of the stand Roger Hinds TR2. The amount in interest shown in Rogers's car is amazing; however, I do not think we managed to convince anyone that it was the result of too much polishing. Many may ask are car shows like this worth all of the hard work that goes into them, I believe that for us who organize them the answer must be yes mainly for the public who come and show their appreciation of the cars and especially for the interest shown by the younger ones who get to sit in them. My thanks go to Andrew, the Red Rose members and John Sykes for their continued involvement. Words - Bob Eccles, Group Leader of Red Rose TRs.